Wooster , Ohio, March 22, 2019 /PRNewswire/ -- The Wooster Brush Company is proud to announce that one of their most popular paintbrush lines — Ultra/Pro® Firm — has grown to include a new variety 3-pack. 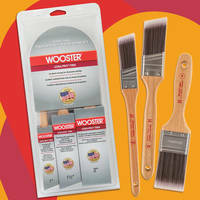 The Wooster 4188 includes one thin angle sash brush (catalog number 4181-1"), one angle sash brush (catalog number 4174-1½"), and one varnish-style brush (catalog number 4176-2") all conveniently packaged in a resealable clamshell. When the Wooster Ultra/Pro product line was launched in 1985, these new synthetic brushes were unlike any other on the market. They had shorter filaments that offered more efficient paint coverage and better cut-in control. Fast-forward nearly 35 years, and even with all the changes in coatings over the last few decades, Wooster Ultra/Pro® paintbrushes are still one of the most successful and imitated brushes on the market. In fact, the only way that the brushes have changed is by incorporating improved tipping processes to reduce drag. This speaks to how Ultra/Pro brushes, like so many Wooster innovations, are far ahead of their time. Foam Paint Brushes produce smooth, uniform finish. Angle Grinder Brushes eliminate vibration during use. Blending Brush targets cosmetic applications.